I’ve JUST finished the book, like two seconds ago, and I LOVED IT. I expected to like it, an a sort of ironic “Isn’t this odd, reading a pseudo Harry Potter fanfiction that was excerpted in Rowell’s Fangirl?” And for a while, I was mostly interested in assigning every character to their HP equivalent, but that quickly turned into genuine investment. “Because it’s death,” I say. Those crazy kids. But seriously, there’s nothing I love more than a romance built on hatred! Or, in this case, mutual obsession that turns into need that turns into trust that turns into a love based on their mutual brokenness. And Penelope! She and Simon are such great friends, and I loved how Rowell had her and Baz become friends too. They all felt like real characters with interlocking lives and independent motivations. Very impressive for, as I mentioned earlier, a pseudo-Harry Potter fanfiction that was excerpted in Rowell’s Fangirl. Half the time, Simon can’t even make his wand work, and the other half, he sets something on fire. His mentor’s avoiding him, his girlfriend broke up with him, and there’s a magic-eating monster running around wearing Simon’s face. Baz would be having a field day with all this, if he were here – it’s their last year at the Watford School of Magicks, and Simon’s infuriating nemesis didn’t even bother to show up. 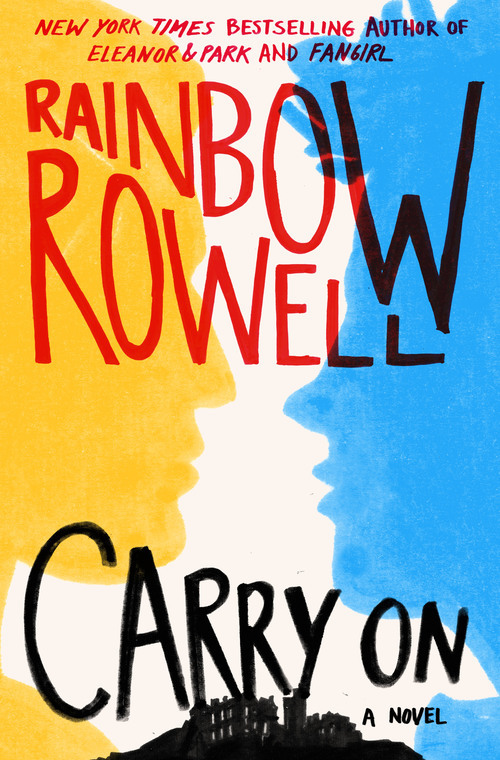 Carry On is a ghost story, a love story, and a mystery. It has just as much kissing and talking as you’d expect from a Rainbow Rowell story – but far, far more monsters. I read and loved Fangirl, but I haven’t read this yet because I really don’t ship Harry and Malfoy, who Simon and Baz are obviously based on, so I just didn’t want to put myself through a whole book of awkwardness… am I right to avoid it for that reason? Hmm, good question! It’s very obviously Harry/Draco, especially at the beginning. But Rowell manages to create a world of her own, and characters of her own, pretty quickly. I’m biased because I loved it, but I think you may as well get it from the library for free and try it out! If you do, I’d love to know what you think, as a non Harry/Draco shipper. Out of curiosity, were you much into HP fandom? Did you ship the book relationships or anything unusual? I pretty much…shipped anyone with anyone, so long as the story was compelling, haha! Oh, but not Snape with students, that always creeped me out. I love HP but no I wasn’t into the fandom much. I liked what was canon (as I usually do for most fandoms) but I would have been okay with Harry/Hermione as endgame too. Same! I like what Rowling did, and I appreciate a male/female friendship. But…Harry and Hermione would make a really great, and powerful, couple! Oh, I completely agree. The more I came to love the friendships, the more I was glad that Harry and Hermione were only a thing in Ron’s fears. I completely agree! Carry On isn’t fanfiction at all—it’s a genuine story. I never really saw the Harry/Draco in Simon/Baz, because I was too caught up in Simon and Baz. Honestly I want to reread it immediately just to experience the dialogue again! Okay, I’m off to read your review now!